Reminiscing about my childhood with my sister, always involves our favorite memories of “swinging from” the branches of our Weeping Willow tree, admiring the colorful spring tulips in front of our house, and “making tea” with the mint leaves in abundance behind our house. Little did I know back then, about the incredible benefits hidden in those mint leaves. Mint has many varieties of plants. In ancient times, it was often used in the kitchen, to flavor dishes and to prepare refreshing drinks. In particular, the Romans and Egyptians used mint to facilitate digestion, and to refresh the breath and the skin. Peppermint is a hybrid, which was created in England in the eighteenth century because of its fresh aroma and its digestive properties. 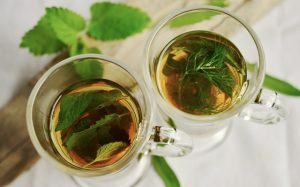 A peppermint infusion after a meal, favors digestion and relieves headaches resulting from poor digestion. Because of its many properties, it is used in the cosmetics industry for beauty products and for the treatment of imperfections such as cellulite, skin with enlarged or sensitive pores, heavy legs and venous problems. Knowing the cosmetic uses of peppermint is important to fully take advantage of its extraordinary properties. Formulations containing this plant are effective in preparations for skin care, and the care of hands and feet. The use of mint is also common in physiotherapy and medicine, where it may be used for various treatments and massages. Soothes sensitive skin: Ideal for soothing sensitive skin irritations due to razor burn or waxing, peppermint acts as an emollient for areas affected by depilation. Try using peppermint essential oil mixed with olive oil on your legs. Relaxes and invigorates: Excellent for relaxing and invigorating massages, mix peppermint essential oil, with sweet almond oil, to make your skin more compact and smoother. Dissolves tension: When used in combination with wheat germ oil, peppermint oil is highly effective in dissolving tension due to fatigue, intense workouts, and muscular contractures. A connective tissue massage relieves pain caused by trigger points or poor posture. Detoxifies and decongests: In facial treatments, peppermint essential oil favors decongestion and detoxification of tissues in case of oily and asphyxiated skin. Purifies and relaxes: With peppermint you also get an excellent purifying mask for oily skin. Mix 5 teaspoons of white clay, 5 drops of tea tree oil and 5 drops of peppermint essential oil. You may also want to add other oils of your choice such as lavender or sage. After mixing all the ingredients, add yogurt and a teaspoon of honey. You will immediately notice significantly cleaner, smoother and brighter skin. When applying the peppermint oil with olive oil mixture to refresh and soothe sensitive skin due to depilation, use Organyc 100% pure, organic cotton rounds. Be Good to Your Skin: Woman Up, Get up, and Take Your Make-up Off!